Today (30 November 2015) the government released command paper 9157 outlining its plans to accelerate delivery of a section of HS2 Phase 2 between Fradley and Crewe. That section, to be known as Phase 2a, is now scheduled to open in 2027, six years earlier than previously planned. The government has also published updated analysis on the business case for HS2, and an “interim report” on the siting of the Leeds high speed rail station. However, the exact routeing of Phase 2 itself has still not been finalised. 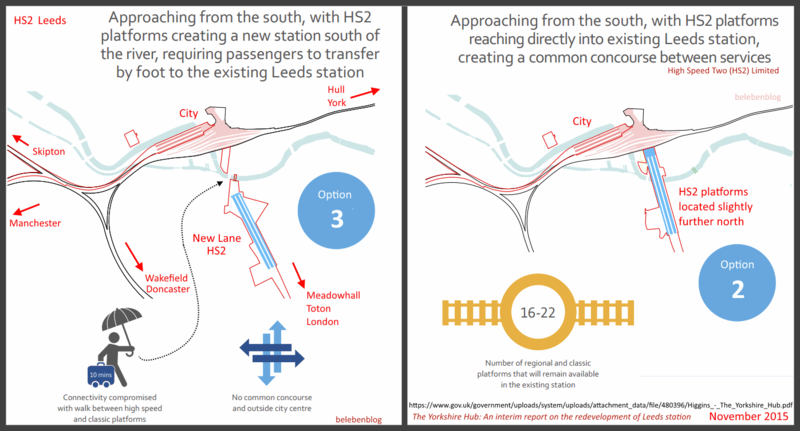 In ‘The Yorkshire Hub: An interim report on the redevelopment of Leeds station’ HS2 Ltd chairman David Higgins presented three options for the siting of the Leeds high speed station. […] After continued engagement with Leeds City Council, local authorities across West Yorkshire, the Leeds City Region LEP, the West and North Yorkshire Chamber of Commerce, and Network Rail, a clear consensus around a single preferred option has emerged. This interim report is being submitted to the Chancellor of the Exchequer and the Secretary of State for Transport to consider, as a recommendation from HS2 Ltd. A full route decision on Phase Two of HS2 is expected later in 2016. 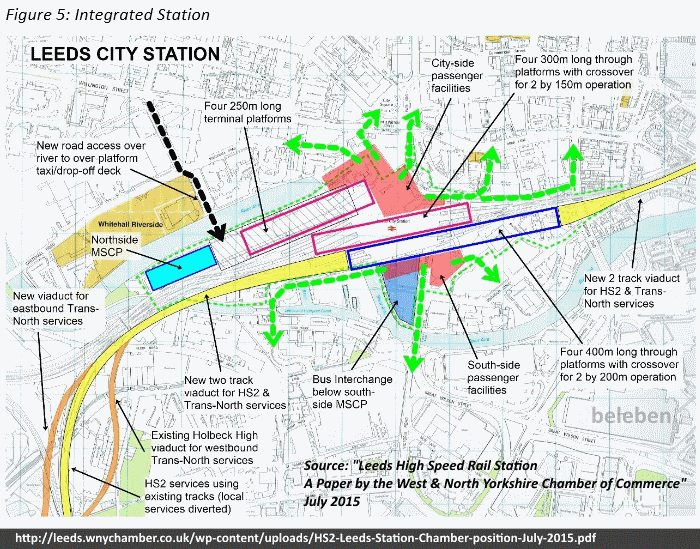 […] The original New Lane [Leeds station site] proposals fulfilled HS2’s brief, but did not sufficiently take into account the changing nature of the wider factors, either in terms of existing and future services or the Council’s plans for the city centre. The danger was that the proposed station would have been too detached from the existing station and too isolated from the city centre. The sum would have been lesser than the parts. The hub effect would have been diminished. Following representations from and detailed engagement with the Council, the Chamber of Commerce and representatives from the wider region on a range of potential approaches, HS2 selected three options from a longer list to prompt further discussion and analysis. The process of engagement we have gone through, in partnership with the region, to decide the best option for the Yorkshire Hub has been a model of its kind. Quite rightly, local and civic leaders made clear their view of the limitations they saw in our original proposals, in particular its failure to connect local, regional and HS2 services and to connect into the existing city centre, and the plans for its expansion. Given the physical constraints of the existing station, and the rising level of demand for services, coming up with a solution that meets all those needs has not been easy. But thanks to the efforts of the Council, the city region and the Chamber of Commerce, as well as HS2 and Network Rail experts, we have reached a consensus. In short, because of both the heavy and growing demand and the constricted site – particularly at the station entrance – Option One was seen as not sufficiently flexible to cope with both HS2 and the anticipated increased traffic the Northern Powerhouse will deliver in the longer term. Whilst this more compact solution was superficially attractive, it does not stand the test of time, as the medium to long-term impact would be a limit on the ability to further extend or enhance the station to handle increased pressure on local services. The result would be detrimental to the transport needs and the wider economic aspirations of the city and the region, as would the disruption of construction in the midst of a working station. Option Three, on the other hand, while feasible, was seen to suffer from drawbacks at the other end of the spectrum as there was too great a distance between HS2 and local services with passengers being exposed to a longer walk, often in bad weather and the lost opportunity to create a common concourse for the first time. It was not seen as an improvement on the original HS2 New Lane proposal. * the ability to allow through trains for local services and Northern Powerhouse rail services to improve links to York, Newcastle and Hull in the East, as well as Manchester and Liverpool in the West, and Sheffield and the Midlands to the South. * the opportunity to create a landmark architectural statement, fitting with the role of Leeds station as a piece of national infrastructure, that Leeds, the city region, Yorkshire and the nation can be proud of. In essence, the new Option 2 is a reworking of the previous Option 3 terminus proposal, with the dead-end platforms moved a few yards to the north. Presumably, the cost of Option 2 must be considerably higher, otherwise it would have been adopted at the outset. But how real is the ‘consensus’ around Option 2? In July 2015, West and North Yorkshire Chamber of Commerce stated that “A station which is able to accommodate HS2 and/or TransNorth rail services running through and onto the East Coast Mainline towards Northeast England and Scotland is essential“. In other words, the Chamber thought that a through high-speed station was a necessity. Of Option 3 (New Lane), David Higgins said ‘the lack of a shared common concourse with local services would make moving between them and HS2 more difficult and make the HS2 station more isolated from the city centre’. But of course, that is exactly the situation proposed for Birmingham, where the HS2 Curzon station site is remote from New Street, the main station for regional trains. The robust management of costs on HS2 will be a fundamental measure of its success and will attract large amounts of political and public scrutiny. Therefore, the key to delivering the scheme within budget will be the blending of collaborative behaviour, new technology and the communication between the systems, people and data, according to HS2 Ltd Head of Estimating, Simon Longstaffe MRICS. […] One thing I have learnt is that we need to take longer over the gestation period of schemes to ensure that we get them right first time. * Improving how electricity demand and supply are balanced. […] For each of these studies, we will engage with the relevant government departments, regulators and delivery organisations, including Network Rail, TfL and the National Grid as we develop our thinking. We are also keen to gather evidence and ideas from local government, businesses, service providers, users and others to support and shape this work. Hence this call for evidence, which sets out the key questions for each of the three reports. The Call for Evidence will allow the National Infrastructure Commission’s work on these studies to draw upon a wide evidence base and spectrum of options. One of the problems with the idea of a national infrastructure commission is its likely propensity to look for infrastructure-based ‘solutions’ to problems which might be better addressed in another way. Another question is how ‘independent’ the Commission’s decision-making would be. Improving connectivity between cities in the north of England would, no doubt, require significant investment in infrastructure. To plan such works effectively, one would need access to a great deal of up-to-date quantitative data. But open data on transport demand and suchlike is severely deficient (for example, because of rail and bus privatisation). All in all, the prognosis is not too good. It seems likely that much of the ‘evidence’ submitted to the NIC will just be the usual special-interest and wonk-tank fare. The catastrophic TGV accident at Eckwersheim on 14 November 2015 was caused by ‘late braking’ into the curve, according to initial findings. Safety systems were partially disabled, because the train was being used for over-speed checks on the new track. There were ‘seven people in the driver’s cabin’, and ‘mistakes of human behaviour’. Obviously, at the speed the train was moving, there wouldn’t be much of a time difference between a ‘normal’ brake application, and a catastrophic brake application. At RTM Magazine’s TransCityRail North event, HS2 Ltd chief executive Simon Kirby spoke about the high speed train procurement process. Kirby added HS2 will be looking for “innovative ideas” from the market when the fleet starts to be procured in just over a year’s time. Richard Westcott, the BBC’s transport correspondent and host for the evening, asked whether Kirby worried about how it will play in the media, when contracts are given to foreign companies. “All the time,” was the reply. But, Kirby asked rhetorically, what exactly is a British company? “For me, it is about creating British jobs and getting value in this country,” he said. “I mean, Hitachi is just building a new factory in Sunderland [sic – the factory is in Newton Aycliffe], and Bombardier in Derby is certainly not a ‘British company’, but there are a lot of British jobs there producing great products. Presumably, if a company is registered in Great Britain, and supplies the British market, then it counts as a “British company”, even if there is no GB content in what it sells. Bombardier rolling stock ‘manufactured’ at its Derby plant is less than 30% British by value. So far as can be established, there is zero GB capability to produce items such as bogies, large aluminium extrusions for carbodies, etc. It seems inevitable that the GB content of HS2 rolling stock orders would be either low, or very low. In August 2013, Labour’s Andrew Adonis said the coalition government needed to “get a grip” on HS2 costs. The architect of HS2, the high-speed rail scheme between London, the Midlands and the north of England, has demanded that the government appoint a dedicated minister for the project to guard it against ballooning costs, poor management and vanishing support. Lord Adonis, who set out the plans for the network as transport secretary in 2010, lambasted the coalition’s inertia and “extremely poor project management”. He warned that increased contingencies in the project’s expanded budget were “an invitation to massive overspending“. In October 2013, Labour’s Mary Creagh repeated the get-a-grip shtick. But the “get-a-grip” / “no blank cheque” shtick appears to have gone down the pan. Now, Labour is calling for ‘up to an extra £500 million’ of public cash to be spent on HS2’s Euston station, for something or other. Euston HS2 has the potential to be a kingsize money pit, so Lilian Greenwood’s “£500 million extra” brainwave would be quite an odd way of “getting a grip”. The new Conservative majority government seems to hold Andrew Adonis in high esteem, as he was appointed as ‘chair’ of the National Infrastructure Commission. The NIC is supposed to ‘enable long term strategic decision making to build effective and efficient infrastructure for the UK’. With Andrew Adonis installed as NIC chair, why isn’t he reversing HS2’s “ballooning costs, poor management, and vanishing public support”? Why hasn’t the government removed the increased contingencies which Mr Get-a-grip claimed were “an invitation to massive overspending”? Could it be, perhaps, that he is a big-mouth charlatan? 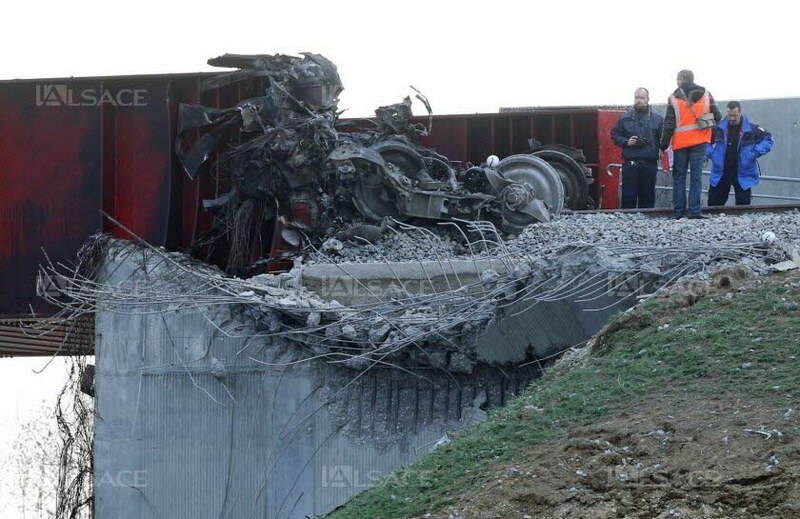 At least eleven people were killed when an Alstom TGV Duplex derailed and caught fire on Saturday 14 November during a non-passenger high-speed test run on phase two of LGV Est near Eckwersheim (Bas Rhin), about 20 km from Strasbourg. The line was scheduled to open in April 2016. At the time of writing, the cause of the accident is unknown. Officially, 49 technicians and railwaymen were assigned to conduct a test run Saturday of the next-generation of the TGV, France’s flagship high-speed train, which was due to go into service next spring. The accident near Strasbourg killed 11 and injured 37, of whom 12 remain in critical condition, according to local deputy prosecutor Alexandre Chevrier. […] A senior official in the Alsace region on Saturday blamed “excessive speed” for the disaster. Selon un premier scénario d’accident dévoilé ce dimanche soir par le parquet de Strasbourg, la motrice a «percuté» le pont [du canal de la Marne-au-Rhin] et «le train a ensuite déraillé avant de basculer sur le tallus de la ligne ferroviaire». Un porte-parole de la SNCF a confirmé ce premier scénario, précisant que dans le choc de l’accident, le train s’était séparé en deux. «Le TGV a quitté la voie au niveau du pont et a percuté des rambardes de protection. Une partie des voitures est tombée dans le canal et l’autre dans un champ», a-t-il indiqué. In Alstom’s TGV Duplex and AGV designs, passenger carriages are carried on articulated bogies, which, according to the company, “minimises the risk of a derailment becoming a very serious accident”. But at Eckwersheim, there was a complete break-up of the trainset. One might argue that in many circumstances, the “semi-rigid link between cars” of articulated bogies could result in reduced, rather than improved, safety. And with or without articulation, the quantum of kinetic energy in very high speed operation is bound to result in reduced accident survivability. Britain’s HS2 trains would operate at higher speeds than those of LGV Est, so projectile debris from an accident would be even more energetic. HS2 is a deeply flawed vanity project, and there is no reason why GB trains need to operate at speeds greater than 250 km/h.